I needed to go to Richmond, Virginia, for "business" yesterday. So I took the plane. (That sounds so cool to say!) I had to be at the Richmond Convention Center by 10:30, in a suit. Mapquest said that it would be a 2-hour and 10-minute drive. It made neither economic nor schedule sense to fly. If I could have flown directly to Richmond, it would have taken 45 minutes, so it would have saved time. Due to the paranoia of those in downtown Washington who have alienated and are therefore afraid of most of the world, however, I could not fly a direct route. Instead, since my airport is North of Washington and Richmond is to the South, I had to fly East or West all the way around the city. That made the flight about an hour and 15 minutes. When you add in the time to do the preflight inspection, do a thorough weather briefing, etc., it took me just as long to fly as it would have to drive. And the plane is a heck of a lot more expensive than driving our Prius. But this was not about practicality. It was a beautiful day. And I'm a pilot. And I'd never flown anywhere for anything work-related. When you put these things together, the equities weighed heavily in favor of flying! It was a beautiful, clear morning. 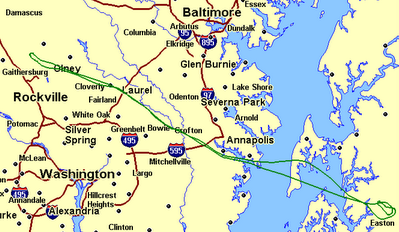 I flew East through the corridor, then turned South and flew along the West side of the Chesapeake Bay for a while. There were almost no clouds in the sky, except for one thin line of cumulus puffs, strung out like misshapen pearls along the coastline. An associate from my firm also needed to be in Richmond for the event, so he drove. Let's compare. He drove for two hours, I flew for an hour and 15 minutes. He listened to his music, I listened to my music. He looked at the car in front of him, I looked at.... Well, here, I'll show you.... This is another boring video of scenery "slowly" passing by (at 135 mph). 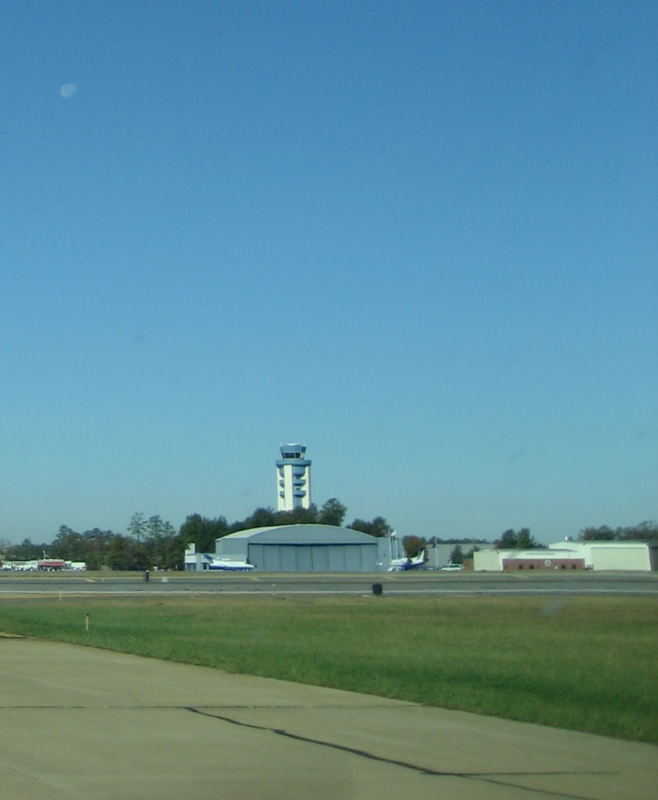 I landed on Runway 34 at Richmond and the tower directed me to the Richmond Jet Center. I caught this next photo as I was taxiing. 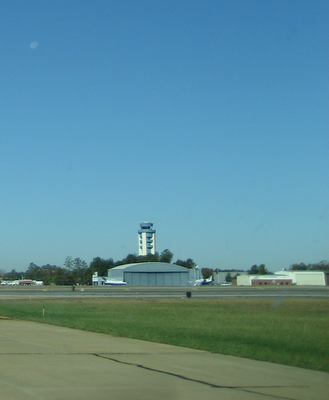 That's the Richmond control tower, with the moon in the perfect blue sky above. This photo really doesn't do justice to what it really looked like, though, because the moon appeared quite large at the time, but looks small in the photo. When I pulled onto the ramp (that's pilot-speak for "parking lot"), a man waved me into position with those hand signals you see them use for jetliners. I shut down the plane, got out, and strolled into the building. I stopped at the desk and asked the lady to have the plane topped off with fuel. She asked if I had radioed ahead for a cab, and when I told her I had, she said it was waiting for me at the front door. As I headed out the door, she asked if I was the pilot or the passenger. "Both," I said over my shoulder, then stepped into the taxi and arrived at the Convention Center five minutes later. Four hours later, a taxi dropped me off at the front door of the FBO. I went in, sat down for five minutes to use their computer to check the weather, then paid my gas bill and walked to the plane. I sat on the ramp in the afternoon sunshine and checked my email via Blackberry, made a few calls, then took off to head back home. The flight back was almost as beautiful as the flight down, but nothing compares to morning sun on the water. When I called Jodie later and told her about my experience, she said, "It's like you were a movie star!" The truth is, it really did feel like I was some sort of celebrity. The people at Richmond Jet Center took care of everything, and I just stepped from the plane into the "waiting car." I've always wanted to "step from a plane into a waiting car." It was pretty cool, and I think it may be addictive as a means of travel. Jodie and I went for a short flight yesterday afternoon. It was a beautiful day -- there wasn't a single cloud in the sky for most of the day, the air lacked much of the usual haze, and the winds were light. Jodie hadn't been across the Chesapeake Bay before, so we headed out that way, I did a touch and go at Easton, and we flew back for a beautiful sunset landing. The whole flight was just gorgeous. This picture (the only one I took) is looking out Jodie's window. 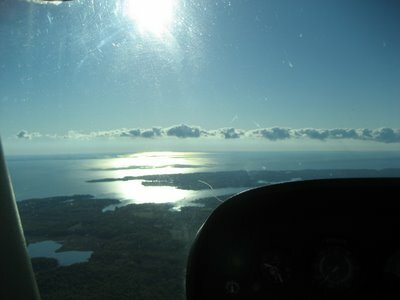 The water is the Chesapeake Bay, looking southwest. The Chesapeake opens to the Atlantic to the south. It was one of those flights that really drives home how much of a privilege it is to be able to fly, at will, and to gain that vantage point . . . kind of like box seating for nature's beauty. Jodie and I went to Paris. There was much more to this trip than aviation, but there were some cool airplane-related highlights. For starters, the flight to Paris was beautiful in ways that can only be seen from the air. As our flight path arced northeast, the sun set to the west over an overcast below us, with just a few towering cumulonimbus in the distance. 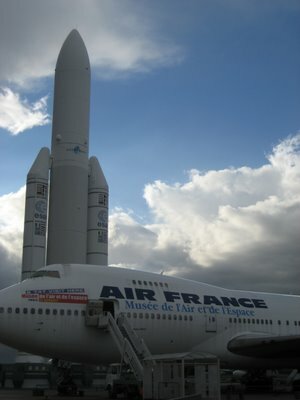 One of the things I wanted to do in Paris was go to the French national air & space museum. We went on Monday, but it was closed, as it is every Monday. The next day, we went to the Louvre, and discovered that the Louvre was closed, as it is every Tuesday. So we went back to the Air & Space Museum. 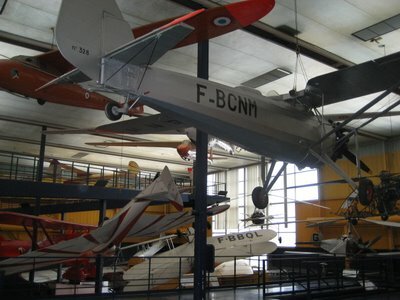 The French have been involved in aviation from the very early days, and this museum had some incredibly rickety examples of early flying machines. Jodie commented that she was impressed with how much those early aviation pioneers must have wanted to fly to put themselves at risk in such rickety crates. I think she compares us all to Icarus. There was a nice collection of aviation art - paintings and sculptures all depicting flight in one form or another. 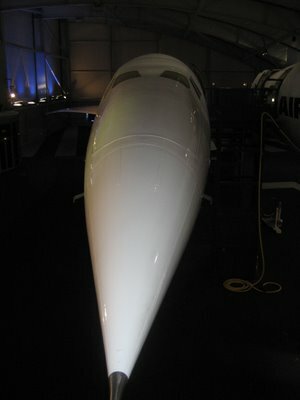 The museum had two Concordes. Known as the "SST" for Super Sonic Transport, the Concorde was the only supersonic commercial jet to ever fly commercially to the United States, and was one of only two ever in service, the other being a Russian Tupolev. 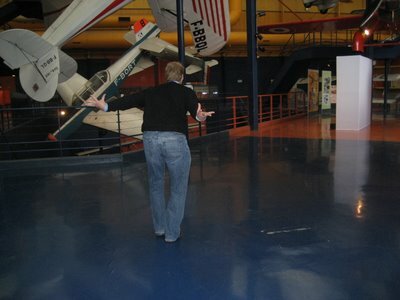 The museum had two Concordes, and we could go through them. To me, the inside felt like a very tight regional jet. 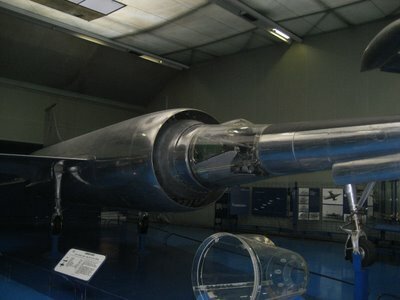 These jets were unique in many ways, all of which can be read about on Wikipedia. The Concorde flew routes from Charles de Gaulle Airport in Paris and Heathrow in London to Dulles in Washington, DC. I remember the last flight of the Concorde to Dulles in 2003. 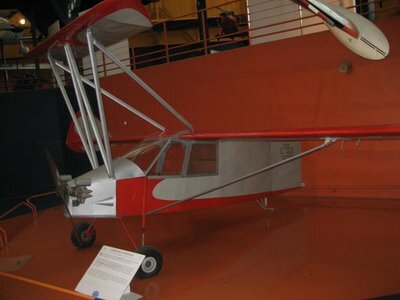 The plane that made that last flight is in the (US) Air & Space Museum Annex at Dulles. 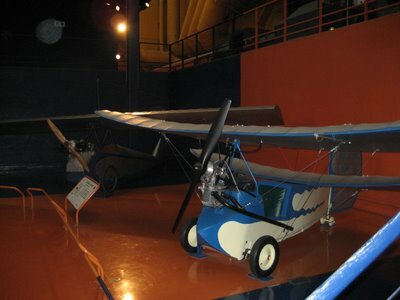 Antoine de St. Exupery is a big name in aviation literature. He was a pioneer in many ways, and was involved in flying the early mail flights to and from French colonies in Africa and South America. He was a thoughtful person, and his work is worth reading. He died after being shot down off the coast of France in World War II. The museum had an entire section devoted to him. This next one is amazing. The entire body of the plane is one big jet engine. The pilot sits in a plexiglass cone in the front! 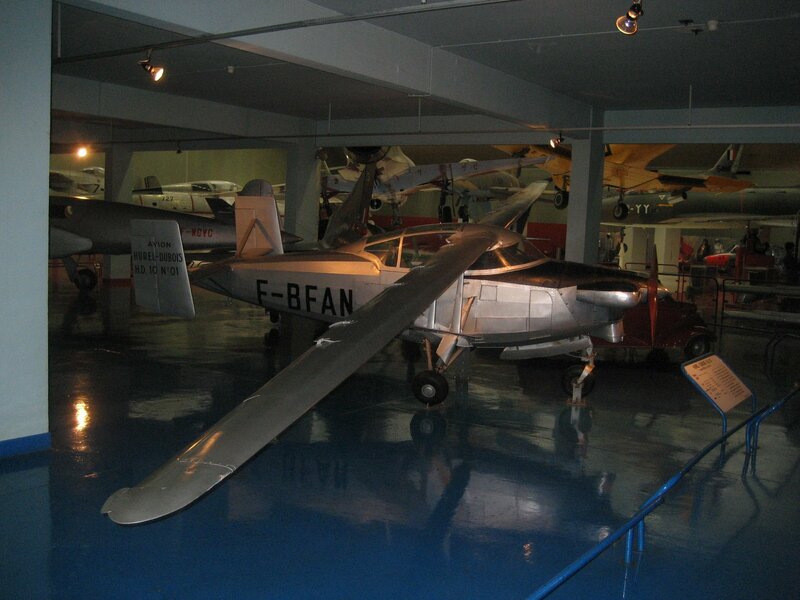 It was kind of like aviation overload, if there could ever be such a thing. 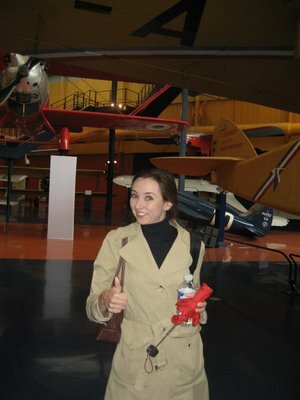 Jodie was a great sport, and enjoyed herself despite not being infected with the aviation virus. Jodie and I went on a date last night. We had a few things to celebrate -- her first week in a new job, her upcoming birthday, etc. There are several airport restaurants around the area that I've been meaning to visit: there's one at the airport in Lancaster, PA, and the crabcakes at Kentmorr on Kent Island in the Chesapeake Bay are legendary. A little while ago I saw a comment online that the restaurant at the airport near Cumberland, Maryland (actually in West Virginia), was also good. Jodie and I had been looking for the right time for me to take her flying, and the promise of dinner at the other end of the flight was exactly the incentive I needed to get her in the plane. Our departure was delayed by stuff we were doing during the day, so we didn't take off until about 6pm. 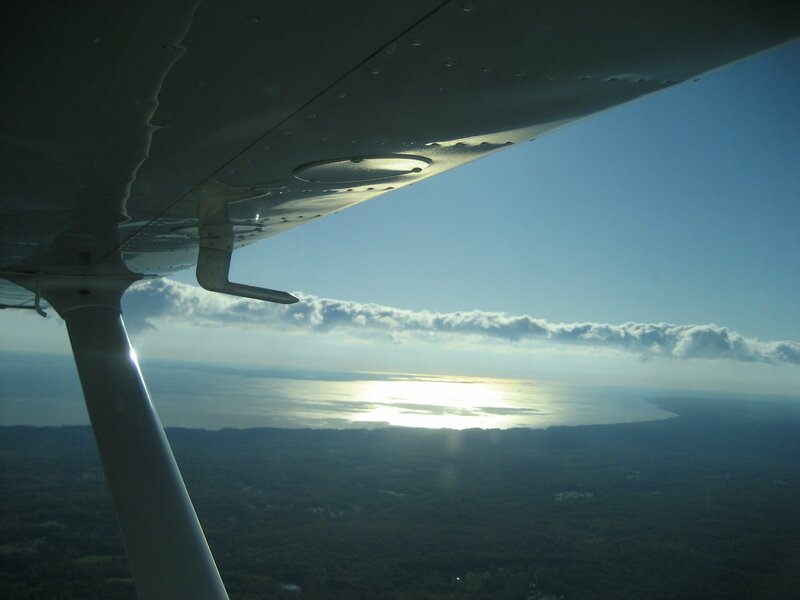 Sunset was about 6:45, so we had a beautiful flight to Cumberland in the late-day sunshine. Jodie was nervous. I did my best to reassure her, and plugged my iPod into her headset so she could listen to her favorite music. I took her over Sugarloaf Mountain, where she and I have hiked a dozen times, then we followed the Potomac River up to Harper's Ferry before heading on a direct line for Cumberland. For a lot of the trip, Jodie was listening to the music, nodding her head and tapping her fingers and mouthing lyrics.... When I made radio calls, though, she could hear them over the music. After one of my radio calls, Jodie looked over and said, "You sound just like a pilot!" There I was, grinning all over myself again. The air was smooth and there was almost no wind. I started a gentle descent several miles out from Cumberland and flew over the last ridge to join the traffic pattern. The day was fading, but there was plenty of light to see the little town as we circled for a landing. My landing was great, and we taxied, parked, then walked over to the restaurant for a home-style meal. It was fully dark when we left to head home. The day had been hazy, and I could only pick out one bright star overhead. There was no moon. Cumberland sits in a valley and is pretty well surrounded by mountain ridges. As we took off, I could not see the ridges very well, so I circled over the lights of Cumberland until we were well above the surrounding ridges, then headed us on our way. There's a stretch of rural country between Cumberland and Gaithersburg where there are NO lights on the ground, and it was DARK. There was no visible horizon ahead, which was a little unnerving. I was flying Three Zero Yankee Romeo (N30YR), which is a newer Cessna Skyhawk with a single-axis autopilot. 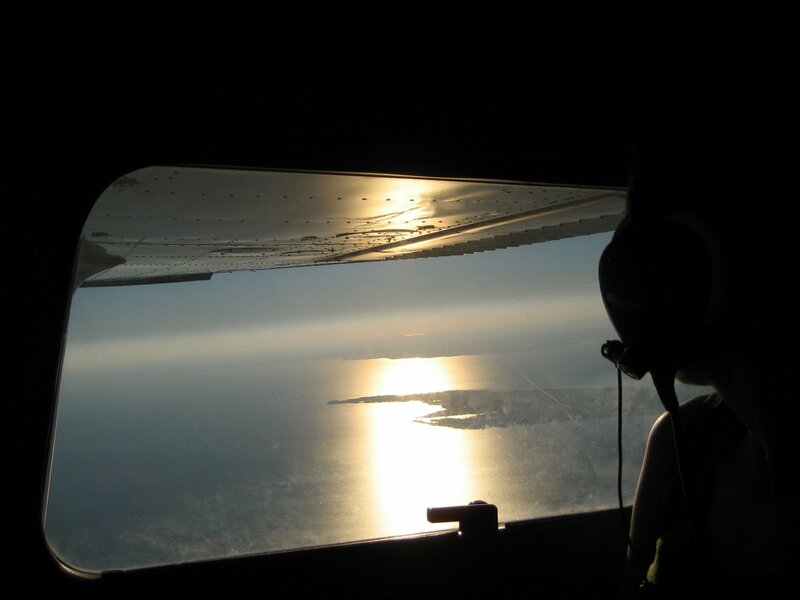 I dialed in our heading and turned on the autopilot, letting the autopilot keep us flying straight while I divided my attention between the various instruments and the blackness outside the window. I was grateful for the instrument training I've received to date, and made a mental note to get back to finish my instrument rating. 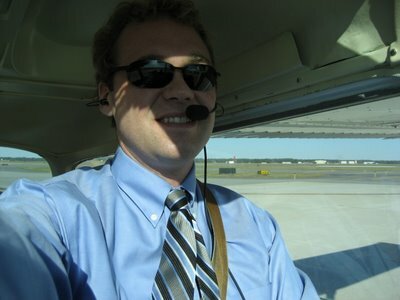 For the first time, I also experienced how an autopilot can significantly reduce the workload on a pilot. If I ever buy an airplane, it will have to have at least a single-axis autopilot. 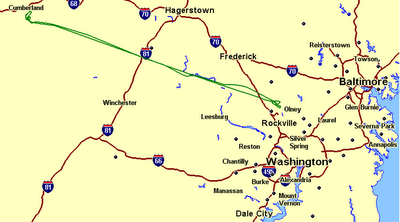 Before long the lights of Martinsburg appeared, then Frederick to our left and Dulles to our right. 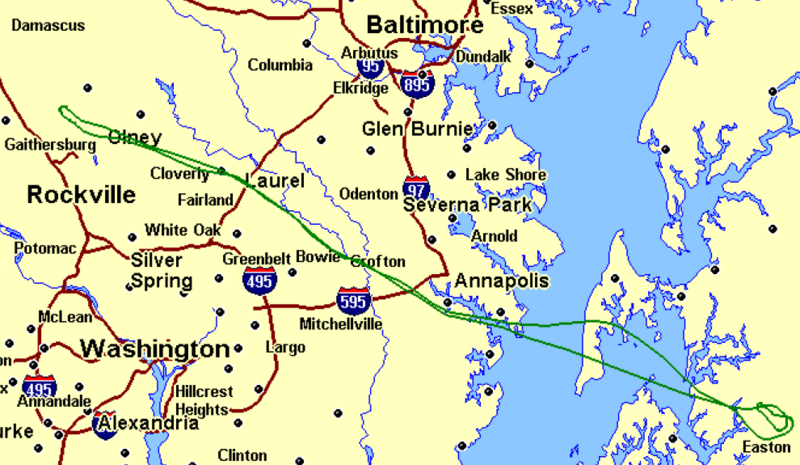 I descended under the shelf of the Dulles airspace and approached Gaithersburg , then circled to join the pattern and land. I let the plane touch down just a little early and we bounced slightly. I said something about a "bad landing," and Jodie said, "Is that as bad as it gets? If so, then I've got NO problem!" I think Jodie had a good time despite her nervousness, which she said started to dissipate immediately after takeoff. I had a GREAT time. It was almost exactly two years ago that I took my first flight lesson, and I got my license almost seven months ago. I've been waiting and dreaming of flying somewhere with Jodie for a long time. It was every bit as fun as I expected it would be, and I can't wait for the next time.